On January 4, 2016, Florida’s State Board of Education will be setting the cut-scores/determining proficiency levels for the Florida Standards Assessment (FSA) that was administered in early spring 2015. The commissioner of Education has reviewed the cut-score levels determined by a panel of education experts, reviewed by a community “reactor panel” and presented to the public. At the last Board of Education meeting, she presented her recommendations, which raised the proficiency bar higher than the educators recommended but apparently not high enough to please several members of the board. On 12/4/2015, the BOE will meet for the last time before the cut score process is complete. You can find information regarding that meeting here. One would expect the conversation regarding proficiency levels will come up. Will the Board be convinced to agree with the commissioner’s recommendations or will they push for higher achievement levels, resulting in lower passing rates for Florida’s students? The question “Why Proficiency Matters” is currently a hot topic in reform circles. In this blog, we will attempt to get into the mind of a reformer and see the issue from their perspective. The best place to start is the Foundation for Excellence in Education’s (FEE’s) annual meeting. The current standards (Common Core State Standards, Florida Standards, College and Career Ready standards, whatever you choose to call them) are developmentally appropriate, well constructed, internationally benchmarked (not just informed by international benchmarks), rigorous standards that will lead to better academic achievement by all students. The current state assessments are a high quality, effective and efficient way of determining whether students are on the path toward Career and College Readiness. The current assessments have been psychometrically evaluated and are fair, valid and reliable for all types of students, including Special Education and English Language Learners. Raising proficiency cut scores on a state assessment will lead to higher levels of academic performance. The debate regarding all of the above will be left alone for the time being (I know it will be difficult; try your best). Introductions were made by the moderator Dr. Christy Hovanetz, Senior Policy Fellow of Accountability, Foundation for Excellence in Education. She explained why she felt now was the right time to have the conversation about proficiency levels (because, having spent so much money on new standards, new tests, new curriculum and professional development, “it would all be for naught” if we didn’t raise the standards). She claimed the current “proficiency gap” (the difference between proficiency levels on state tests and proficiency level on “the Nation’s Report Card” or NAEP assessment) was a result of states not being honest with their students. The proficiency gap, she claimed, was really an “honesty gap”, a result of states, essentially, cheating the system, and it needed to be corrected. Mr. Sargard concluded by noting that we will know whether this works if we see smaller gaps with NAEP (he was hoping to see this in the 2015 NAEP scores), lower remediation rates in college, higher college graduation rates and students getting good jobs after college… then we will know if we have been successful. The final audience question was from Florida BOE Vice Chair, John Padget. He felt this was a really great panel and he reiterated the need for honesty (possibly his question is a plant from the Foundation?). He claimed he has repeatedly seen students who have finished high school and are told when they show up at college “you are not college ready.” He wanted to know what can we do to be honest at an earlier point so students don’t face disappointment at that time. (Going to take off my reformer hat here for a moment to say: personally, I would suggest attending parent-teacher conferences and meeting with the high school counsellor, to get a good idea as to whether your child is on track for success in college… putting the hat back on now). Dr. Bice replied with some comments about how community colleges actually make a lot of money providing remedial classes and there might be a financial incentive for them to recommend remediation. Karen Nussle wanted to end on a positive note. According to her, the testing products are better than ever. Millions of kids have taken the PARCC tests and we can compare data across states. The tests are great and can only get better Parents are going to get more information about their kids than ever before. The amount of data collected is fantastic. This is working and we have to keep at it. We need to stop allowing others to distract us from where we are going because this is working. Lots of applause. Dinner will be served at 6. Raising the achievement bar to NAEP levels is something we all want. The key to Alabama’s success was providing this policy safe space in these first few years to not misuse assessment results. Test scores should be used to make instructional decisions, ensuring students are provided a curriculum and instruction that will get them more college and career ready. Guard against using test scores for policy agendas that don’t lend themselves instructional improvements. One of the things that’s really important is being patient with the scores and do not try to use them too soon. Use the proficiency level to communicate about student learning and use your accountability system to monitor your system and, if changes need to be made there, you do that in the accountability system, or the way that you use those scores. Do not use them, especially at the upper grade levels, as a high stakes, get out of high school sort of assessment. You can take off your reformer hat now. Proceed with the issuing of school grades based on the new FSA. Do NOT listen to the School Superintendents who are asking for a pause. So, Ms. Levesque suggested that Florida set a cut score aligned with NAEP scores (an “honest” one) AND issue school grades, in direct conflict with what essentially every Session VII panelist recommended. Why didn’t she listen to her own experts and recommend a pause in the use of test scores for anything except improving instruction during the transition period? Did she miss the strategy session just a few days earlier or does she disagree with its conclusions? We recommend that Florida use the initial few years of the FSA administration as recommended by the FEE panelists and institute a policy free zone. This may take the doing of the legislature and/or the Governor but, as Dr. Bice strongly recommended, it is necessary part of the process. A complete re-evaluation of the accountability system should be done. Listen to the experts and use the FSA scores only to improve instruction. Eliminate the high stakes. With raised proficiency levels the cut scores will no longer reflect expected grade level performance. Do legislators intend to retain and remediate third graders who are reading at or above grade level? Should these tests be used as a high stakes, get out of high school sort of assessment? 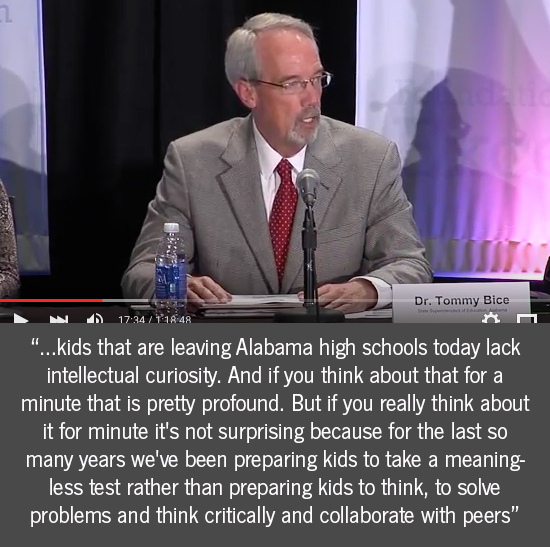 Does our Board and Department of Education really want our schools and teachers to continue to focus almost entirely on test scores for fear of punitive repercussions or should they use those test scores, as Dr. Bice strongly suggested, “to make instructional decisions, to make sure that we’re providing a curriculum and instruction that get kids more college and career ready”? One final question: Why would Ms. Levesque advise the Florida Board of Education to do something that her entire panel of experts would disagree with?